This is the moment you’ve all been waiting for: Today is first morning of our 25 days of giveaways! We’re shooting off with this perfect Starry Night tent for two. Evrgrn, REI’s in-house brand, has a mesh-topped bungalow that will keep you warm and cozy, and help you experience the great outdoors. How ’bout celebrating REI’s #OptOutside than with a delicious camping experience with this pretty blue guy? To enter to win, follow us on our Facebook and Instagram pages, and follow the instructions in the posts. You can enter 1x per platform. See rules below. Go here for a list of all the goods we’re giving away. We’ve got crazy-good gifts coming up! 1. HOW TO ENTER: This contest begins 8:01 A.M. PST on 11/27/14 and ends 8:01 A.M. PST on 11/28/14. To enter online, go to https://www.facebook.com/sunsetmag or http://instagram.com/sunsetmag and follow instructions to submit your Facebook or Instagram comment. Limit one entry per person, per day, on each social platform. Sponsor is not responsible for lost, late, illegible, incomplete entries not received for any reason. Entries become sole property of Sponsor and none will be acknowledged or returned. By entering, Entrant warrants that his or her entry (1) is original and does not infringe the intellectual property rights of any third party, (2) has not been published in any medium or (3) has not won an award. 2. JUDGING: All entries will be judged by the Digital Associate Editor, based on the following criteria: Originality (25%); Creativity (25%); Use of language (25%); and Appropriateness to contest theme (25%). In the event of a tie, an additional “tie-breaker” judge will determine the Winner from among all such tied entries using the judging criteria above. Incomplete and/or inaccurate entries and entries not complying with all rules are subject to disqualification. Decisions of judges are final and binding. Winner will be notified on the social media platform they entered. 3. ELIGIBILITY: Open to legal residents of the 50 United States and the District of Columbia who are 19 years or older at time of entry (“Entrant(s)”).Void where prohibited by law. Employees of Sponsor and its promotional partners and their respective parents, affiliates and subsidiaries, participating advertising and promotion agencies (and members of their immediate family and/or those living in the same of household of each such employee) are not eligible. 4. 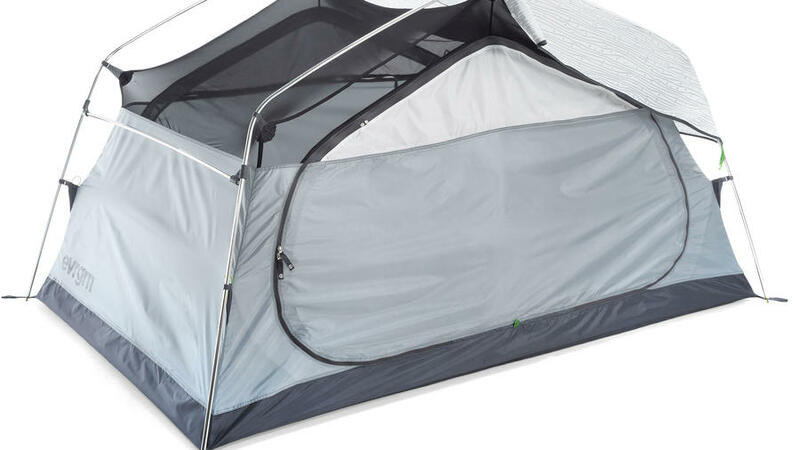 PRIZES AND APPROXIMATE RETAIL VALUE: One Winner will receive an Evrgrn Starry Night 2 person tent. Approximate Retail Value: $199.00. All other expenses not specified herein are the responsibility of the Winner. ALL TAXES ARE THE SOLE RESPONSIBILITY OF THE WINNER. The prize is awarded without warranty, express or implied, of any kind. Limit one prize per person or household. 5. CONDITIONS OF PARTICIPATION: No transfer, assignment, or substitution of a prize permitted, except Sponsor reserves the right to substitute prize (or prize component) for an item of equal or greater value at Sponsor’s sole discretion. Nothing in these official contest rules shall obligate Sponsor to publish or otherwise use any entry submitted in connection with this Contest. All federal, state and local laws and regulations apply. Entrants agree to be bound by the terms of these Official Rules and by the decisions of Sponsor, which are final and binding on all matters pertaining to this Contest. By entering, Entrant represents that any Facebook or Instagram comment and other materials submitted as part of Entrant’s Contest entry are original and will not constitute defamation or an invasion of privacy or otherwise infringe upon the rights of any third party, and that the Entrant owns or has the rights to convey any and all right and title in such Facebook and Instagram comments and other materials. In addition, by entering, Entrant grants to Sponsor a non-exclusive, worldwide, royalty-free license to edit, publish, promote, republish at any time in the future and otherwise use Entrant’s submitted [photo(s), essay, etc. ], along with Entrant’s name, likeness, biographical information, and any other information provided by Entrant, in any and all media for possible editorial, promotional or advertising purposes, without further permission, notice or compensation (except where prohibited by law). Potential Winner, as a condition of receiving any prize, also may be required to sign and return an Affidavit of Eligibility, a Liability Release and where legally permissible a Publicity Release and confirmation of a license as set forth above within 7 days following the date of first attempted notification, certifying, among other things, the following: (a) entry does not defame or invade the privacy of any party; (b) entry does not infringe upon the rights of any third party; and (c) the Facebook and Instagram comments and other materials submitted are original and have never been published and entry has never won an award. Failure to comply with this deadline may result in forfeiture of the prize and selection of an alternate winner. Return of any prize/prize notification as undeliverable may result in disqualification and selection of an alternate winner. Acceptance of the prize constitutes permission for Sponsor and its agencies to use Winner’s name and/or likeness, biographical information, Facebook and Instagram comments, and other materials submitted for advertising and promotional purposes without additional compensation, unless prohibited by law. By entering and/or accepting prize, Entrants and Winners agree to hold Sponsor and its promotional partners, its directors, officers, employees and assigns harmless for liability, damages or claims for injury or loss to any person or property relating to, in whole or in part, directly or indirectly, participation in this Contest, the acceptance and/or subsequent use or misuse, or condition of any of the prizes awarded, or claims based on publicity rights, defamation, or invasion or privacy. False or deceptive entries or acts will render the Entrant ineligible. Sponsor, in its sole discretion, reserves the immediate and unrestricted right to disqualify any entrant or prize winner, if either commits or has committed any act, or has been involved or becomes involved in any situation or occurrence which the Sponsor deems likely to subject the Sponsor, entrant or winner to ridicule, scandal or contempt or which reflects unfavorably upon the Sponsor in any way. If such information is discovered by Sponsor after a winner has received notice of his prize and before the prize is awarded, Sponsor may rescind the prize in its entirety. If a portion of his/her prize has already been awarded, Sponsor may withdraw the remainder of the prize that has been fulfilled. Decisions of the Sponsor are final and binding in all matters related to this paragraph. Sponsor is not responsible for any typographical or other error in the printing of the offer, administration of the contest, or in the announcement of the prize.